Let’s start with all of the things that The Wrath and the Dawn could have done. It could have given the readers a love triangle to frustrate the most easy going reader. It could have provided us with a strong heroine who suddenly shifts in character and falls apart due to a man. We could have been given women who hate each other due to their beauty, or jealousy. Honestly, this novel could have fallen into every trope imaginable, and somehow the author managed to move past these boundaries and therefore succeed in writing one of the best debuts that I have ever read. Instead, Renee Ahdieh wrote a novel that encompasses love after it has grown and become something real, between two characters who grow and learn with one another. Characters who only lose themselves in the moment, still maintaining their sense of self and strength while learning to allow another past the walls around their hearts. The slow burn love story in The Wrath and the Dawn is admittedly the best part of the novel. It is the core of the novel, weaving through every page, yet it doesn’t take away from the underlying plot, the question of why Shazi is there in the first place and the struggle that Khalid has every waking moment. I loved LOVED Shazi and Khalid. I loved them separately, and together. Honestly Shazi is the closest that I have had to a “spirit animal” in a very long time. Her strength was believable as she also showed her weaknesses. Her wavering between her desire for revenge, and confusion over her feelings for new husband was not at all off putting, and I appreciated the conflict in her mind and heart. Khalid has his own secrets and he is often described as being stern, boring, or angry (along with having eyes comparable to a tigers…hubba-hubba!) Shazi brings out a different side of him, though it is a subtle change to anyone who is not close to him. This “monster” of a man who has been accused of killing so many women finds pride in his wife, and can be seen playing with the bangles on her arm as he lounges back amongst other nobles. The secondary characters were also fantastic. I LOVED Jalal, what is it about the Captain of the Guard always being so playful and dreamy? His devotion to Khalid despite their differences was heart melting and I adored the way in which he cared for Shazi, the fact that he thought of her as family was incredibly apparent. Despina was fantastic, and strong in her own right. She was possibly one of the only people who dared to not only stand up to Shazi, but call her a brat on a daily basis. A true friend is one who will call you out when you are being a brat, indeed. Even Tariq, Shazi’s childhood sweetheart was likable, believable and kind. I especially love the way in which Shazi reacts to him, with strength and conviction in her feelings. She was always true to herself even when confused or when faced with the possible “shame” of turning her back on her mission of vengeance. I did not for a moment worry that this novel was going to fall into love triangle territory as there was very little wavering, and it was apparent that Khalid held her soul. Each of these characters were layered and came with their own secrets, and their own form of strength. Ahdieh weaves an intricate and beautiful story that follows many twisty paths. She manages to draw the reader into the novel with her immaculate descriptions of the character’s surroundings, and the food that sits in front of them. Her descriptions are so vibrant that I could smell the rain storms, and lilacs in Shazi’s hair. If I am being honest, the only thing that slowed down the novel a little for me was the side stories. Despite the fact that they absolutely weave into the main storyline, and are clearly relevant and will be fleshed out in book two, I still yearned for Shazi or Khalid every time we were away from them. Speaking of book two, I can’t wait to see how things play out. The ending to The Wrath and the Dawn was intense and heart wrenching, I honestly don’t know what to think. Overall this novel absolutely exceeded my expectations and kept me absolutely yearning for more. 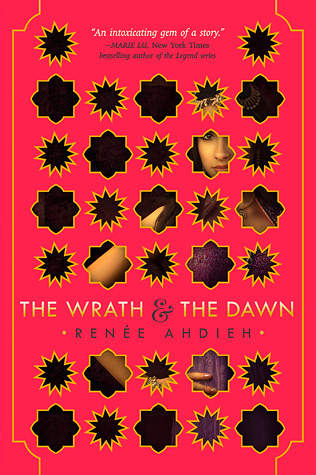 Shelf Talker: The Wrath and the Dawn absolutely blew me away. Words, and this review, cannot do justice to the vibrant world, complex yet relatable characters, and breathtaking love story. If you are looking for a novel that has the feel of a familiar tale while also weaving in new twists, a novel filled with secrets and intrigue, and a novel with a romance that you will feel at your core, The Wrath and the Dawn is a must read. I also promised that I would add in the phrase “Ohh MAH LOINS” to my review as well, as it was one of the phrases I fell back on as I was reading. This entry was posted in Reviews and tagged Authors, diverse books, fantasy, love, magic, retelling, retellings, reviews, romance, swoons, young adult. Bookmark the permalink. THIS SOUNDS SO AWESOME! I have heard pretty wonderful things so far, and CANNOT wait to pick it up. I can’t wait for it to be released! I am reading this very, very soon and after seeing you gushing about it on twitter and in this glowing review I am SUPER excited! Glad to hear the secondary characters were also fantastic. That is always a big one for me. Thanks for the review! Okay, seriously, I need this book. I need it in my life. It sounds all sorts of amazing, and I am eager to have a copy to tear through when it finally publishes!